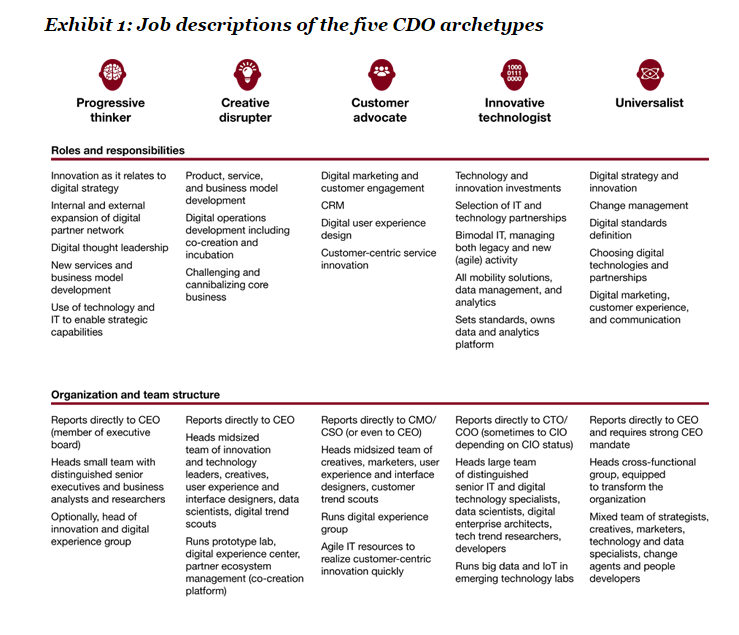 Hiring a CDO can prove disruptive to businesses, creating competition and conflict between the anointed digital leaders and CIOs and potentially CMOs, says PwC. But there is some good news. The rise of the chief digital officer (CDO) has generated its fair share of agita among CIOs, many of whom view the role as competition for their IT budgets or as a threat to their authority. 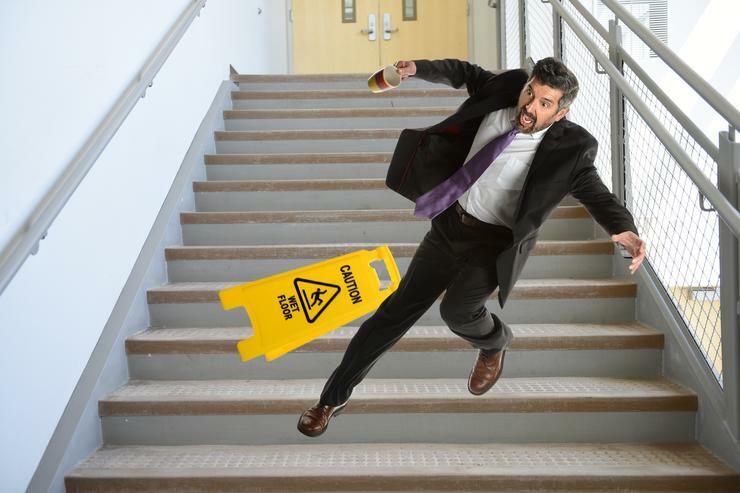 CEOs must recognize that bringing in a digital leader from outside can disrupt IT and marketing departments if the transition isn't handled delicately. Chris Curran, PwC principal and the chief technologist. "There is a big risk in creating [the CDO role] because you can disenfranchise big parts of your organization,” says Chris Curran, PwC principal and the chief technologist, who has witnessed this first-hand. Curran says that a financial services client he is working with hired a CDO with a broad purview that includes building customer-facing technologies, data and analytics and partnership alliances. While the firm’s marketing department has seen its customer segmentation improve markedly after the CDO arrived, this had led to direct conflicts with the IT department. 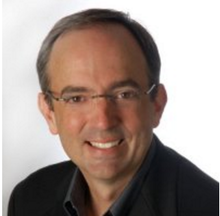 "It's really going to hurt the CIO and IT from an internal competitive sense," Curran says. Such nightmare scenarios – no CIO wants other departments capturing some of their budgets -- are a big reason why CIOs want digital tucked under their wings. Although only about 6 percent of the world's top 1,500 companies have installed a CDO, companies are assigning increasing importance to the notion of a dedicated digital leader, PwC says. But the good news is that companies don’t need a CDO to have a digital leader, which PwC defines as someone who is critical in defining his or her company’s strategic direction and ensuring its transformation into a fully digital enterprise. That leader can be the CIO, CMO or some role other than an actual CDO, Curran says. 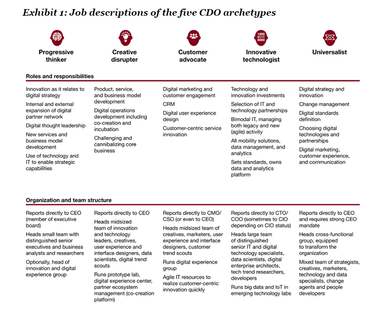 To help CEOs figure out what type of digital leader they need to accomplish their goals, PwC has outlined five CDO archetypes that detail a CDO's potential range of responsibilities. The progressive thinker: Collaborating closely with the CEO, the progressive thinker will focus on digital strategy and innovation. He or she will borrow digital ideas from their industry as well as the world at large. This executive thinks about how the business could be transformed through digitization. Curran says industrial companies, as well as those in chemicals, oil and gas, and mining should consider hiring a progressive thinker. “This is a CDO who can bring the inspiration and expertise needed to further digitize a company’s current strategy,” he says. The creative disrupter: The creative disrupter offers a more hands-on approach to the continuous development of new digital technologies and business models and solutions. Curran says the disrupter is especially valuable in companies facing severe and dramatic changes as a result of digitization in consumer-oriented industries, such as publishing and retail. Like the thinker, he or she must work directly with the CEO to generate the competitive differentiation that will lead to revenue growth and increased profitability. The customer advocate: Best suited in customer-intensive industries such as retail, banking and travel, advocates will work with or replace CMOs and sales heads as they focus solely incustomer satisfaction. Companies with product portfolios already differentiated through digitization could limit the CDO role to that of customer advocate and experience transformer. The innovative technologist: Similar to a CIO or CTO, this CDO promotes new digital technologies, such as Internet of Things, mobility, social media and analytics, to transform the company’s value chain. Curran says companies in manufacturing industries should consider turning to these executives to further optimize their supply chains and bring digital technologies to factories and to key production steps such as design and prototyping. The universalist: This is the dream role for CIOs who regard themselves as highly strategic.This CDO manages all aspects of a digital transformation. This executive reports to and has absolute execution power from the CEO. Well-suited for companies behind the curve in digital, the universalist shepherds the development of digital strategy as part of the broader corporate strategy and can devise new business models or revenue streams. They also control digital marketing and the customer experience. Curran notes that many companies remain unsure of what they want or need in a digital leader.